For those of you that haven't noticed yet, I changed the comment system on the site yesterday. 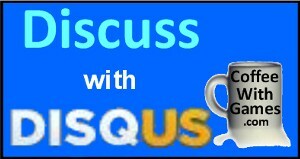 While the Blogger comment system worked fine, I made the change to the Disqus comment system after a reader sent me an email saying he was trying to upload his coffee mugs photo to the comments, but he couldn't figure out how to do it. The reason he couldn't figure it out though, is because the Blogger comment system doesn't have an upload feature for photos. It was actually the second time in a week that the lack of photo upload feature was mentioned, in one way or another, because Keith from RespawnAction.com mentioned that he was going to leave a comment/photo on the "That's like a dollar an hour!" post, but realized even if he found the photo he was looking for, he wouldn't have been able to upload it. If you have a Blogger account you may be wondering, "Coffee, can I still comment with my Blogger account, or do I have to create a Disqus account?" So yes, you can still comment with your Blogger account, and you just select the "Google" button in the box as shown above. Also if you wish, you can create a Disqus account for free and use that to comment, or the plethora of other choices including Twitter and Facebook accounts. Hopefully those of you that have already commented with the new Disqus system found it easy to use, and if you have any issues/questions about it just let me know! Do you find the new Disqus comment system easy enough to use? Any likes, or dislikes? I really don't like or dislike it particularly. It's nice not having to plug in code words on every post and nifty that it seems to pick up on other things like my IGN profile, but there's the whole setting it up thing too. all and all though, not bad and I've seen several sites going to it now. Yea, it's been around a while. I looked at it a year ago or so, but they didn't have the "import" comments option for Blogger, so that was the main reason I didn't use it then. After seeing they had updated the service with the "import" comments feature for Blogger though, and the ability to attach images, I figured why not? I think it will be interesting to see in the future though if Disqus is purchased by a larger company, because it does seem to have good tech behind it. Also, if you are interested in setting it up, and have questions feel free to ask if you get stuck on something. I'm torn with features and like and don't like. Not a big fan of signing up for an account as I don't like it's google integration where I have no control of what name appears when I post. Though the account setup is done and it does have some nice features like including an image and having the option to post via email reply. One thing I miss is a way to subscribe to all site comments via RSS feed like I could with google. I haven't looked very much, but the links above this box only seem to apply to this post. @Chalgyr: Plug in code words? "Not a big fan of signing up for an account as I don't like it's google integration where I have no control of what name appears when I post." You can always post your name as "anonymous" and choose the text that appears. I'll check my settings, and see if there is a "subscribe all" RSS feed option, not sure about that. How do I change my display picture? Sorry for the stupid question. I'm not sure actually, and (when) I have checked the Disqus forums, and if I find the proper answer, I'll submit it here for you. If you have a disqus account there is an option in the account settings. Yeah, overall not a big issue since I'd need an account for DigitallyDownloaded.net anyway. Think I got the site rss feed thing worked out; just had to link to a different url. Kind of odd as the comments on digitally downloaded seem to still be coming through on the google/blogspot rss url. Oh well. Do you think this imformation? About personal estimation, I see this review is fantastic. It take for you necessary knowledge. Thank for share! Disqus is my most favorite blog commenting system. Wow, very nice artice, Disqus is best blog commenting system I have ever use. Wow… This is great! I can say that this is the first time I visited the site and I found out that this blog is interesting to read. Thanks for this awesome monitor. ya i think its intresting blog coffe with games .everyone share own personal views on this blog. Dont you think guys that Maria slots is much better than this ... ? Dont you think Maria slots are more interesting to play rather than this? After seeing they had updated the service with the "import" comments feature for Blogger though, and the ability to attach images, I figured it why not? Also, if you are interested in setting it up, and have questions feel free to let ask if you get stuck on something. I'm not sure actually, and I have checked the Disqus forums, and if I find the proper answer, I'll submit it here for you. Yea, sorry. I was thinking more for the Blogger login image, going off when you said, "...where I have no control of what name appears when I post." But yea, with a Disqus account, you can just upload the image you want it to display; thanks for clarifying that! you turn out helpful points that I concur with and appreciate. thanks for this prime notch material. Yes, I would very much like to hear some innovative ideas. thanks for sharing all the innovative ideas here with us.i liked almost all of them.good stuff.keep it up.learning games children. Registration is very difficult, anyone help me with that? I really don't like or dislike it particularly. like or dislike it especially.